Warm, windy weather and dry conditions are making things worse for rural firefighters locked in battles with a trio of wildland fires that have been burning within 75 kilometres of Edmonton, officials said Monday. 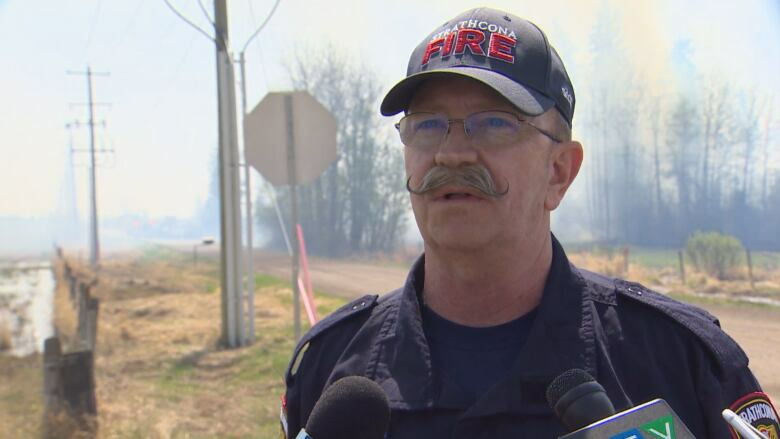 "The biggest challenge is the weather right now," said Bob Scott, deputy fire chief for Strathcona County, where a blaze that started Saturday has now grown to more than 300 hectares. ​"It's very, very dry. We haven't had any appreciable rain in the past while that's making a difference in helping to green things up," he said Monday during an update with reporters. "So as a result, the warm temperatures and drying winds that we've got, it's presenting the challenge of causing the fires to intensify." 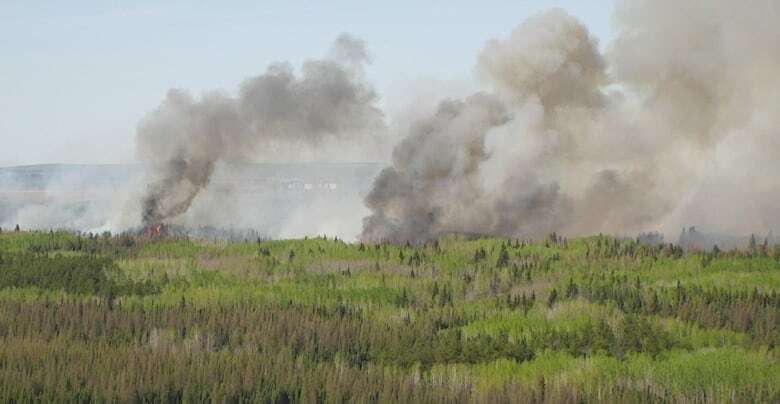 The Strathcona county fire is burning near Bruderheim, Alta., about 65 kilometres northeast of Edmonton, in the area of Township Road 564 and Range Road 211. Scott said the fire is classed as being held though he noted, "It's definitely not under control." The second major fire in the region is 13 kilometres east of the Strathcona fire, in Lamont County. Rob Singleton, manager for Lamont County, said that fire has been contained. The third major fire is in Westlock County, near the hamlet of Vimy, Alta, about 70 kilometres north of Edmonton. That fire is now contained and under control, said Leo Ludwig, the county's chief administrative officer, that fire is now contained and under control. Strathcona County's Deputy Fire Chief Bob Scott said the weather is the biggest challenge being posed right now to firefighters. In all three cases, the cause of the fires is still officially under investigation. Scott said after key natural or industrial elements are ruled out, the source is usually human. "If there's no lightning in the area and if there is no other cause, like electrical lines that have failed, that sort of thing, then really we end up looking at a human cause," he said. Fires that have gotten out of control and carelessly discarded cigarettes are obvious sources, but all-terrain vehicles can create sparks that can ignite the tinder-dry grass, he said. In Westlock County, preliminary investigations indicate that people shooting firearms on Crown land may have been responsible for that blaze. Sparks from a ricochet or a target are suspected to have set the fire, Ludwig said. Most of Alberta is currently under a fire ban or restriction, according to albertafirebans.ca, an interactive and searchable website created by the government. Scott said that website also includes information about restrictions on off-highway vehicles. Strathcona County: No buildings have been lost, although a farmhouse and outbuildings were protected by actions of firefighters on Sunday, Scott said. Three farms have been voluntarily evacuated. Fifteen firefighters, two command staff, four brush trucks, three bulldozers and a helicopter are being used to fight the fire. "We'll be able to keep a handle on it," said Scott. "We've got crews assigned right up through to Friday. We'll be doing rotating crews, our equipment is working well, we`ve got a lot of support from other Strathcona County departments. I think we`ll be able to stay on this fire at least until Friday, or until the weather changes and we can re-evaluate the situation." Westlock County: The fire has reached 150 hectares. There have been no evacuations, and an alert issued to five families on the weekend has now been lifted. A fire restriction in the area was ramped up Monday morning to a full fire ban. Ludwig said some hot spots remain and about 45 provincial firefighters were on the scene Monday attacking hot spots and smoldering areas. But conditions are ripe for flare-ups with the temperature expecting to reach 27 C Monday. "We have high wind in a different direction today, hot temperature and the humidex is supposed to get quite low," he said. When the humidex falls below the air temperature, the fire hazard increases significantly as the flammability of the fuel increases.